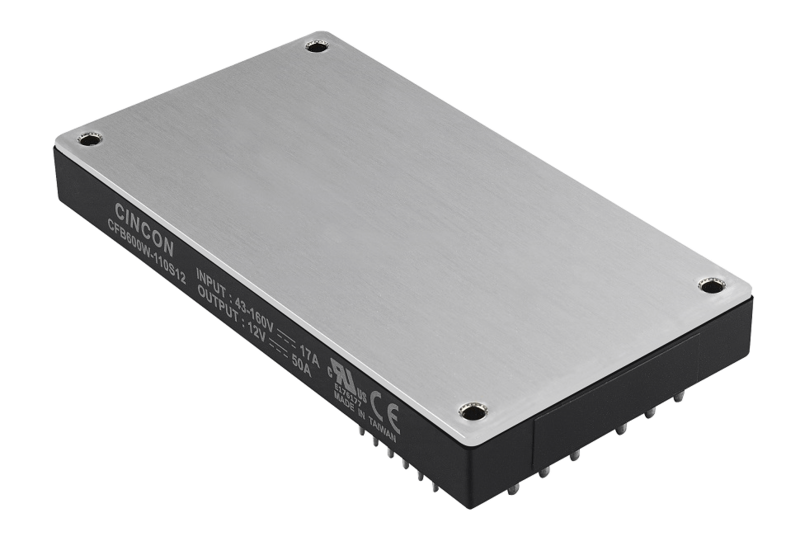 The DC-DC converter CFB600W-110S offers 600 watts of output power @ single output voltages of 12, 24, 28, 48VDC with industry standard full-brick dimension. It has a wide (4:1) input voltage range of 43 to 160VDC (110VDC nominal) and 2250VDC basic isolation. High efficiency up to 88%, with a case operating temperature range of –40°C to 100°C. An optional heat sink is available to extend the full power range of the unit. Additionally, this product has a low no load power consumption (25mA), an ideal solution for energy critical systems. Compliant with EN50155, EN45545, EN50121-3-2. The standard control functions include negative logic remote on/off (remote on/off for positive logic is optional), and +10%, -40% adjustable output voltage. Fully protected input UVLO (under voltage lock out) against output over-current, output over-voltage and over-temperature and continuous short circuit conditions. CFB600W-110S series is designed primarily for common railway applications of 72V, 96V, 110V nominal voltage and also suitable for distributed power architectures, telecommunications, battery operated equipment and industrial applications.